After years of glorifying charcuterie, bacon, and hefty chops, chefs are beginning to push produce. Spring onions and a sugar snap pea, quinoa, and radish dish at Sarma. For Scelfo, this is something of a departure. 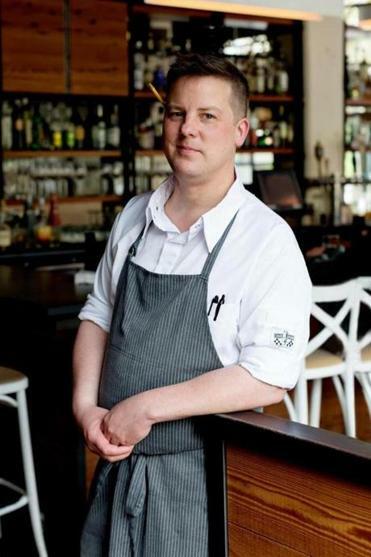 His menus as executive chef at Russell House Tavern and Temple Bar were meat-centered, heavy with charcuterie, riffs on beef Wellington, and pork trios. 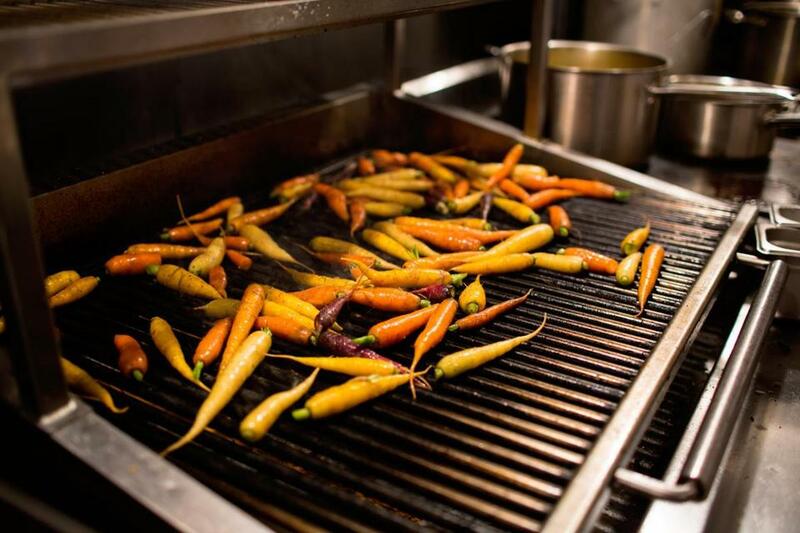 Alden & Harlow’s menu, on the other hand, offers dishes like grilled carrots, purple and orange varieties plated with yogurt, honey, and granola. Squash is grated into thin ribbons and served with pecorino cheese, raisins, hazelnuts, and brown butter. And, titled with a wink, there is Ubiquitous Kale Salad, fresh and crisped leaves with thin slices of fennel and creamy pistachio dressing. 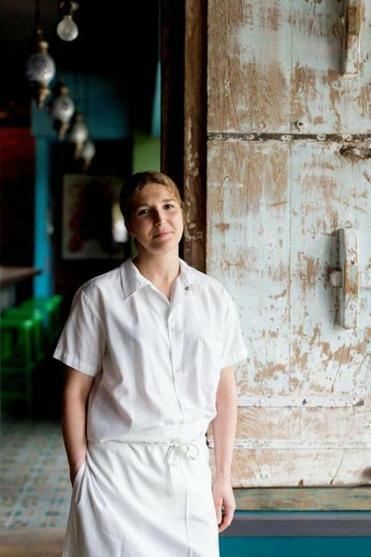 Cassie Piuma, chef and co-owner of Sarma in Somerville. For instance, the pork skewers on Piuma’s menu at Sarma came about as a way to showcase spring onions, charred and served with romesco sauce. “The pork came as an afterthought,” she says. 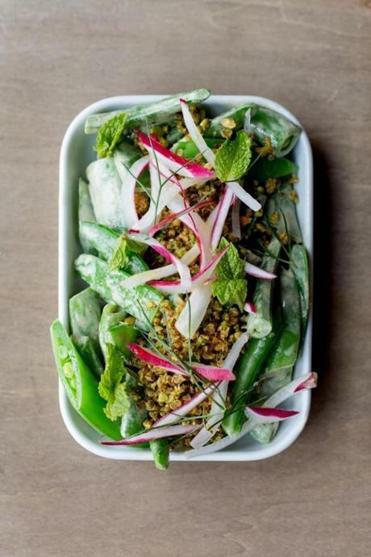 Sugar snap peas appear in a dish inspired by the Middle Eastern eggplant spread baba ganoush. The pods are blanched bright green and coated in a thick pistachio tahini sauce, then garnished with pistachios, fried garlic, and fried quinoa. “It’s crunch on top of crunch,” Piuma says. One of her favorite spring dishes consists of asparagus with avgolemono, the traditional Greek egg-and-lemon sauce. 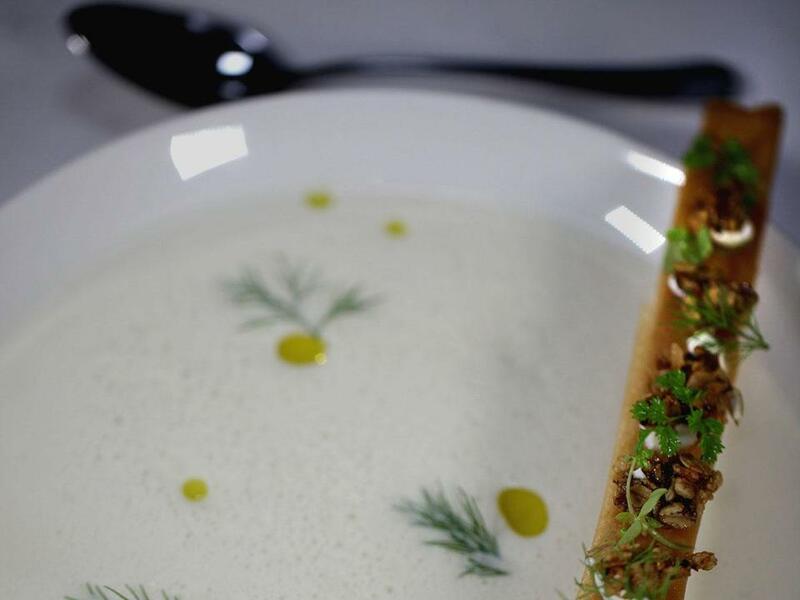 The asparagus is roasted to concentrate its flavor, and the avgolemono gets an asparagus infusion from stock made with the fibrous ends of stalks. 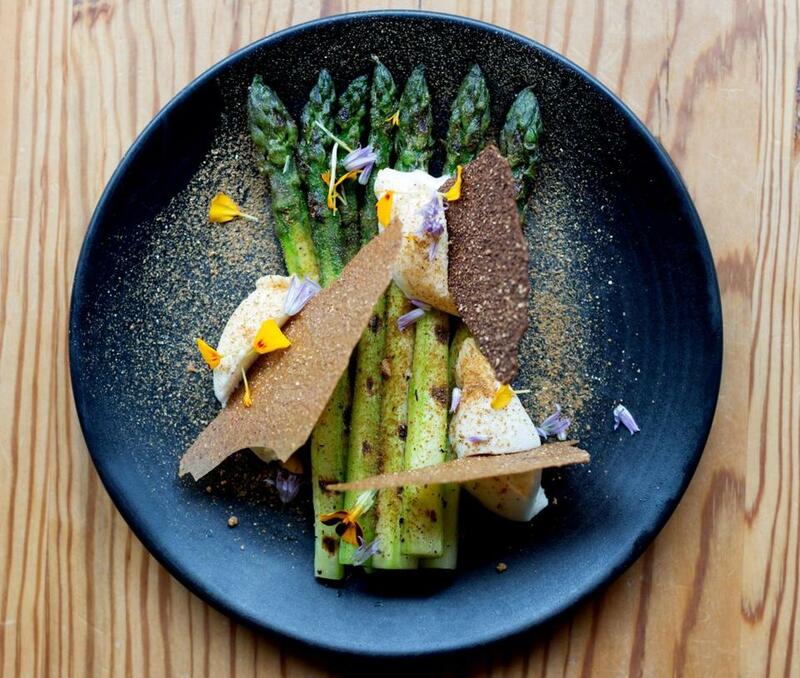 The asparagus is served with black truffles and an egg coated in kataifi, which is shredded phyllo dough, then fried. The asparagus was Piuma’s inspiration, her building block. The other elements fell into place around it. An asparagus dish at West Bridge in Kendall Square. Chef-owner Matthew Gaudet of West Bridge. 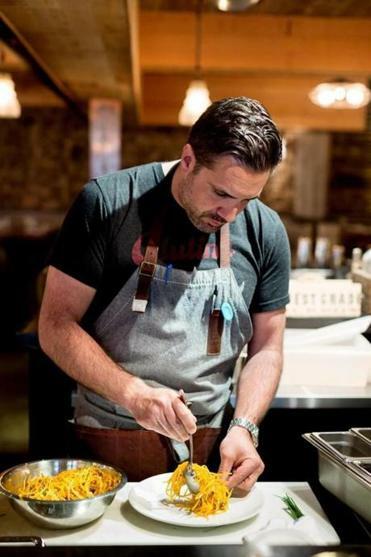 Cooking this way has been an evolution for Gaudet. Once he might have started with rack of lamb or chicken and figured out what vegetables to put with it. Now it is the other way around. “We work seasonally, so we try to think about vegetables and what’s great and how they can promote themselves at the center of the plate, and then garnish with meat and fish if it’s necessary,” Gaudet says. So although the food may be vegetable-oriented, it is not vegetarian. Impressing that upon diners is one of the biggest challenges West Bridge faces, Gaudet says. 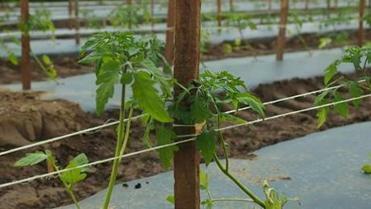 “We are lightening it up, making things fresher for people,” he says. “Spring especially is exciting. When we go into winter, we think, ‘How are we going to manipulate a turnip into something awesome?’ ” Or, in spring, what are they going to do with beautiful white asparagus from France? The answer: Make it the star of the plate, complemented by sardines and tangy sauce gribiche, a cousin of mayonnaise. Gaudet, too, stresses the importance of texture, maximizing the innate flavor of each ingredient and incorporating crunch, creaminess, sweetness, and acid for contrast and balance. “If it’s missing something, it needs more vinegar. That’s my motto,” he says. For a twist on eggplant Parmesan, the kitchen roasts eggplant and covers it with a layer of kataifi to mimic the crunch of breading. A relish made with raisins and sundried tomatoes, similar to the Basque dish piperade, takes the place of tomato sauce. And for the cheese, there is tofu whipped with black cardamom and yuzu juice. Michael Scelfo, chef-owner of Alden & Harlow, prepping butternut squash pasta. The rise of vegetables in restaurants wouldn’t be possible without the increased availability of high-quality local produce. Alden & Harlow gets many of its ingredients from operations such as Verrill Farm in Concord, MacArthur Farm in Holliston, Blue Heron Organic Farm in Lincoln, and The Food Project in Dorchester. Sarma relies heavily on Siena in season; other purveyors include Verrill, Equinox Farm in Sheffield, and Sparrow Arc Farm in Copake, New York. West Bridge also works with Verrill, Siena, and Sparrow Arc, as well as L’Espalier chef Frank McClelland’s Apple Street Farm in Essex and Eva’s Garden in Dartmouth. All buy from wholesalers — such as Baldor, Katsiroubas Bros., Russo’s, and Specialty Foods — that offer produce from local growers. Carrots at Alden & Harlow in Harvard Square. 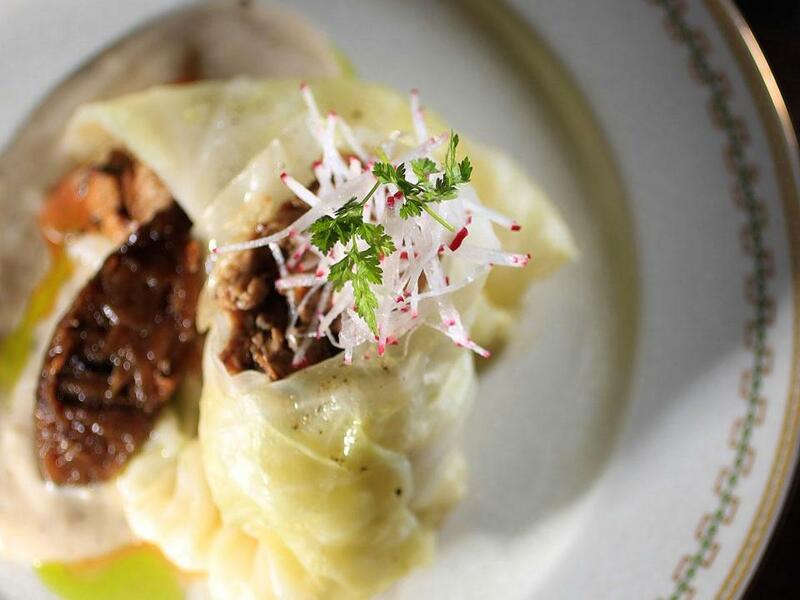 A stuffed cabbage dish at Fairsted Kitchen. This incredibly welcoming Washington Square restaurant in Brookline showcases vegetables in small plates with Eastern European and Mediterranean flavors — think cauliflower with capers, raisins, and anchovies, or a potato cake fried in duck fat with yogurt and paprika. 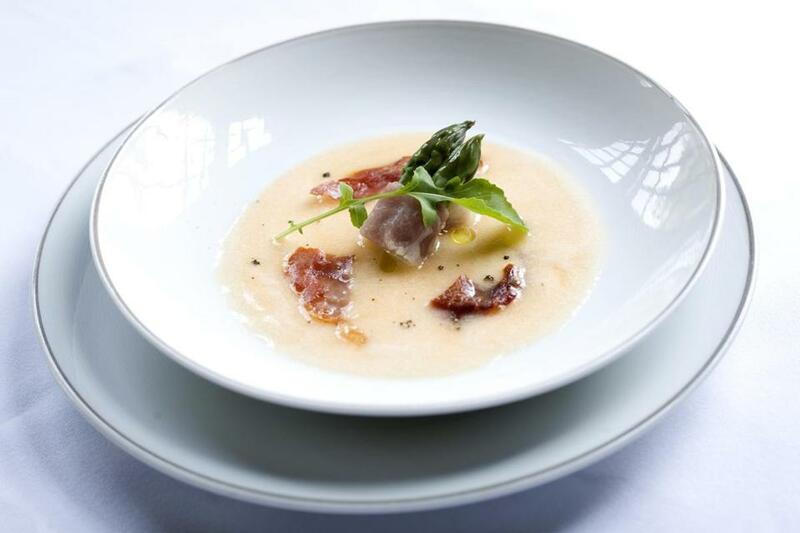 Cantaloupe soup with asparagus and prosciutto at L’Espalier. Frank McClelland, chef-owner of this elegant French-inspired restaurant, is also a farmer. He operates Apple Street Farm in Essex, and L’Espalier’s menu showcases its produce — the likes of greens and sprouts early in the season, more as the weather warms. There is also a glorious vegetarian tasting menu. 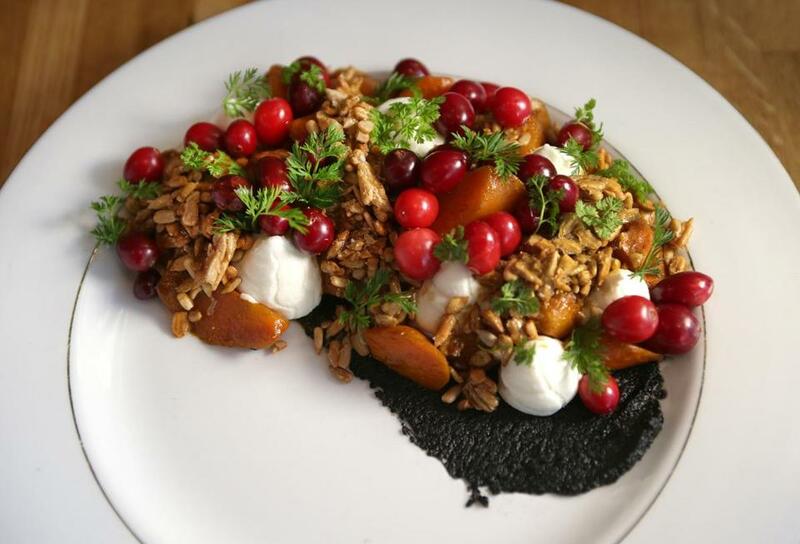 The carrots & seeds dish, made of maple lapsing glaze, ricotta, sunflower seeds cranberries, and black sesame at Mei Mei. Siblings Andy, Irene, and Margaret “Mei” Li began operation with a food truck, then added this restaurant. Examples of their “creative Chinese-American cuisine”: corncakes with sriracha aioli, red curry with vegetables and rice cakes, and hand-pulled noodles with almond yogurt, turnips, and greens. Cauliflower soup served with a crouton and savory granola at Puritan & Co. Chef Will Gilson began cooking as a teen at the Herb Lyceum, the restaurant on his family’s Groton farm. At Puritan & Company in Cambridge, he riffs on New England fare with dishes like cod or scallops with pancetta, spring succotash, and grilled lettuce. 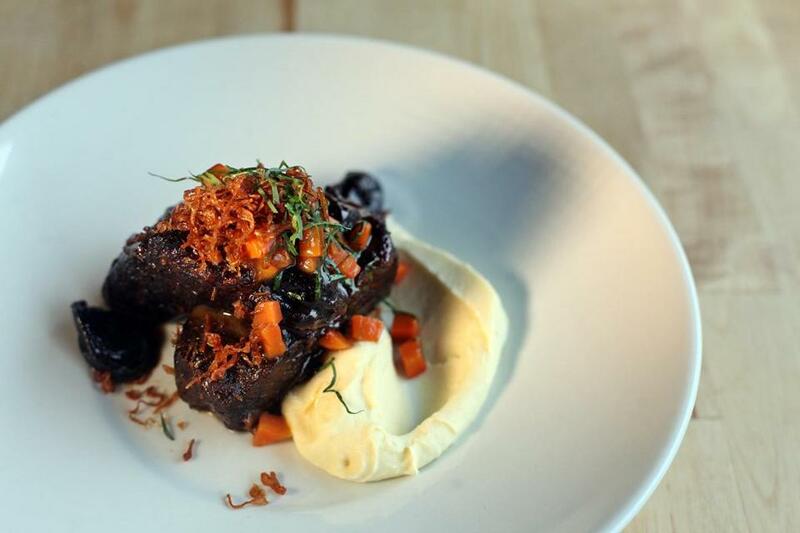 Sycamore’s daube de boeuf — niman ranch beef, parsnip, and chantenay carrots. At this Newton bistro, chefs David Punch and Lydia Reichert serve French-, Spanish-, and Italian-inspired fare that does justice to vegetables. You might find baby artichokes and carrots a la grecque with buffalo mozzarella or spring vegetable paella featuring fiddleheads and ramps. Devra First is the Globe’s restaurant critic. E-mail her at dfirst@globe.com. Follow her on Twitter @devrafirst.